I love the holidays for the time spent with my family and for the food. Every year on Christmas we drive to my hometown and spend the day with my extended family. It’s a fun time full of laughter, fun, presents, and food. Holiday dinners are always one of my favorite meals. We have the traditional dishes that we eat every year and then there are always a few additions. On Christmas the foods that we have every year are ham, cheesy potato casserole, baked pineapple, and pierogies. I am always in charge of making cookies and dessert. In the last few years I’ve also been trying to make a fresh and healthy side dish to sneak in with all of the other holiday foods. I like to use seasonal produce when I make my dish. For Thanksgiving I made a raw broccoli salad with fruit and nuts in it and it was a big hit because it was the only dish with fresh vegetables and fruits in it. For Christmas I’m going to be making a dish with fresh Florida Strawberries in it. I’m lucky that I live on the east coast so Florida Strawberries are available from November through April which is perfect timing for the holidays. Did you know that just eight medium strawberries contain more vitamin C than one orange? Plus, research by the USDA indicates that strawberries may help fight cancer, heart disease, and other illnesses so not only do Florida strawberries taste good but they are good for you too! This year I wanted to keep the red and green theme for Christmas so I decided to make a Strawberry Pecan Salad with homemade Balsamic Vinaigrette. I know I’ve said it before but whenever I’m looking to make a fancy salad I look for a few key ingredients. I like to have a fresh fruit which in this case will be the sweet and juicy Florida Strawberries. 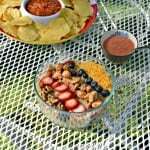 Then I like to have a bit of crunchiness which I’ll get from the pecans. I’m also a big fan of cheese and in this case I’m using a creamy goat cheese crumbled on top. It’s also important to have fresh lettuce for the base of a salad. I like to use a combination of greens and in this case I used iceberg lettuce, romaine lettuce, and spicy arugula. 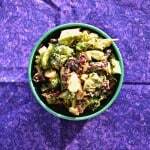 I simply toss the greens together ahead of time and then sprinkle the toppings on top. 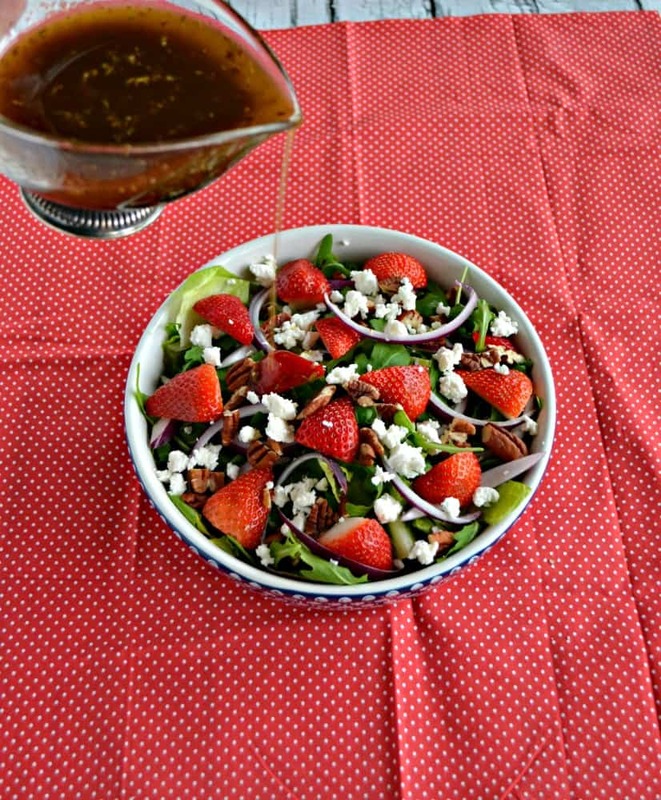 Then I whip up a sweet honey balsamic dressing and serve it on the side. 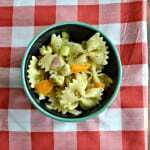 It’s the perfect red and green fresh holiday side dish that is healthy and delicious. 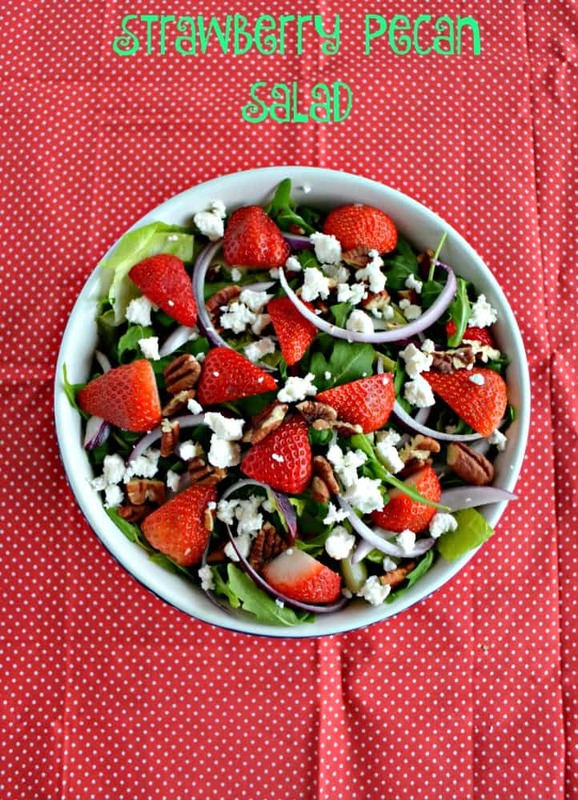 Try this refreshing salad with fresh greens, juicy Florida strawberries, and toasted pecans! 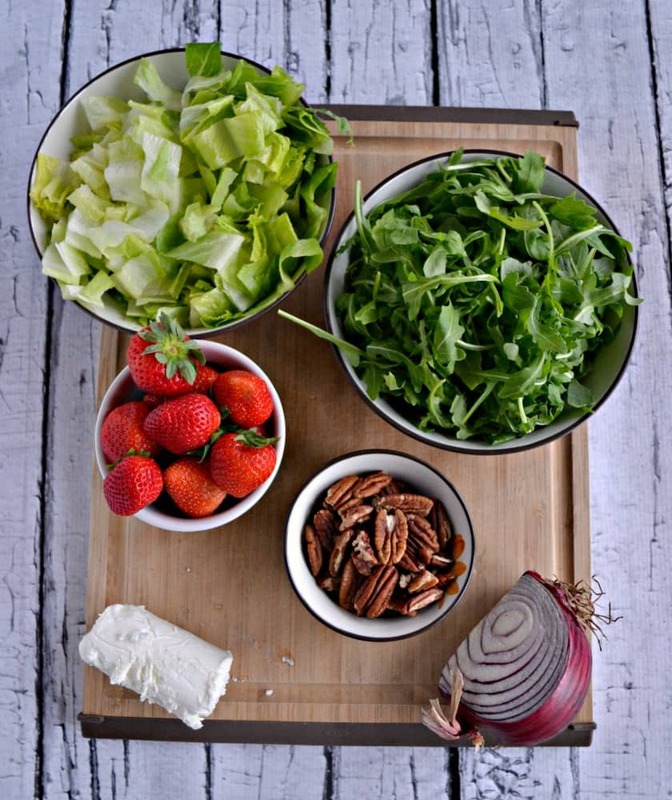 To make the salad toss together the iceberg lettuce, romaine lettuce, and arugula in a large bowl. Mix in the Florida Strawberries and red onion. Sprinkle the pecans and the goat cheese over top of the salad. 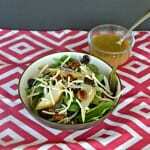 To make the dressing combine all the ingredients in a small mason jar and screw on the lid. Shake the dressing vigorously for 30 seconds. Serve the dressing on the side and enjoy! Florida Strawberry is having an awesome giveaway! The giveaway begins on December 12, 2016 at 12:00 a.m. and ends on February 12, 2017 at 11:59 p.m. To enter, submit a fabulous photo with Florida strawberries and receive a free Florida Strawberry cap plus get entered for a chance to win a getaway to Florida at the TradeWinds Island Resort in St. Pete’s Beach. Airfare, accommodations, and a tour of a strawberry farm in Plant City for up to 4 people is included! Check out this link for more information. Isn’t amazing how few simple ingredients bring so much flavor? I love that Florida Strawberries are available in New York all winter long! This salad looks so fresh and delicious! It is amazing! I’m so glad Florida Strawberries are available here in Maryland too. It’s so cold and snowy but having a taste of summer in these berries helps! 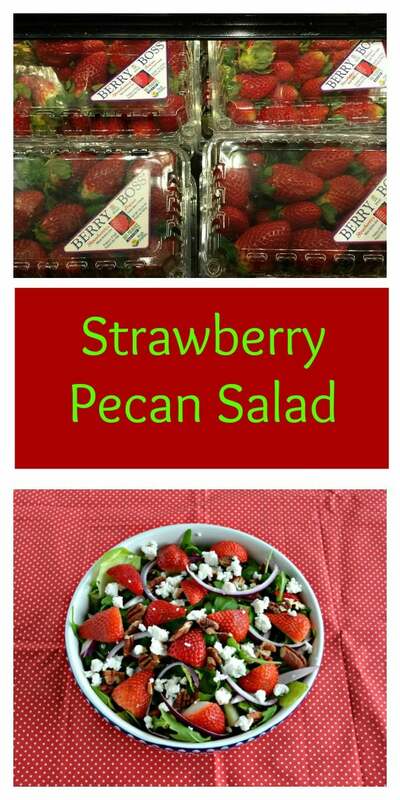 So refreshing to see strawberries in a salad this time of year! Sounds like a tasty salad and I love how colorful it is too. Great salad! 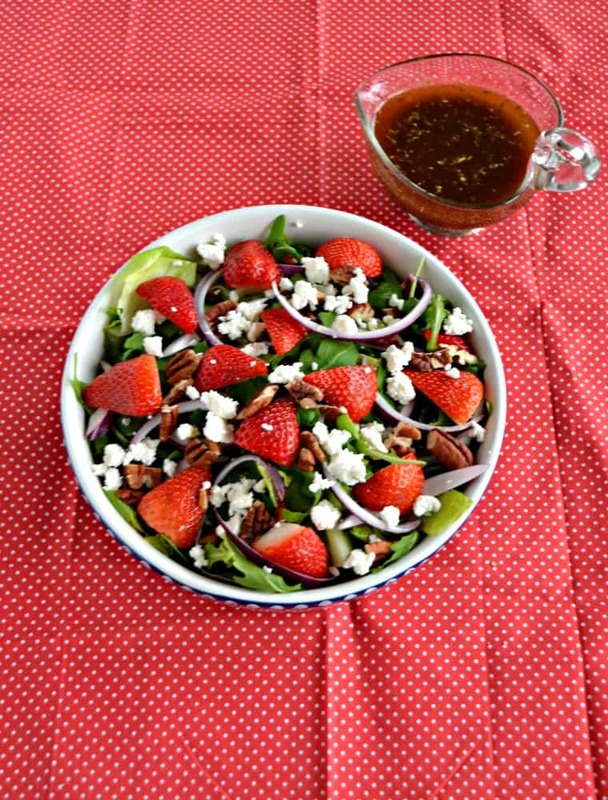 I love how you incorporated the delish Florida strawberries with greens. Truly, the colors of the season.